WHO IS AFRAID OF SANTERIA AND AFRICAN SPIRITUALITY? 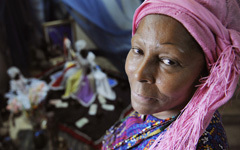 Award-Winning film-maker Ishmahil Blagrove, Jr. speaks to Nancy Pulles Mendez about the significance and relevance of the Afro-Cuban religion Santeria and questions why African Spirituality has not taken its rightful place amongst the major established religions of the world. Explain to me what Santeria is and its significance to Afro-Cubans? Santeria is the religion that many slaves brought with them from <?xml:namespace prefix = st1 ns = "urn:schemas-microsoft-com:office:smarttags" />Africa. For us Santeria is a fraternity, a union of spirituality; it helps us to cope, bond and feel the pain of others. When we were brought to Cuba as African slaves, the Spanish forced us to worship the European Catholic saints; what the slaves did was to mask the identity of our African gods behind the façade of the European saints, thus creating a new image and meaning of the holy saints. In that way the African gods survived. It was a very serious crime to be caught worshipping African gods; slaves were often massacred and killed, and were severely punished for not worshipping the European gods. At the moment, Santeria is one of the most popular beliefs in Cuba, perhaps because the Cuban people recognise that this religion has more human feeling and a greater connection to reality. In Santeria, we believe in stones, water, nature and the reality we are living every day. Many white Cubans have now embraced Santeria with its African-centred beliefs, why is this? That is not a problem for this religion; there are many white people here in Cuba and all people are the same. It is the ancestral situation that makes people come together in the fraternity. Many people believe African spirituality is about the worship of evil spirits. This religion has nothing to do with evil; this is a religion of fraternity, it is a religion of feelings, it is the beliefs that our grandfathers have practised from generation to generation. Nevertheless, many people confuse the meanings of the religion. What unites us as people is our connection to our common ancestors and our feelings towards our ancestors and spirituality; this is not the religion of the devil. Santeria is closely associated with the Yoruba people of Nigeria. Yes, the religion has deep roots in Yoruba. Yoruba is very important to us because the principle roots of the religion are from Yoruba and we, the Afro-Cuban people, feel for Africa because Africa is the mother country of all Afro-Cubans. Unfortunately, African spirituality is not afforded the same status and respect amongst other diasporan groups; what can be done to reverse that? Our culture is our religion and we cannot make our customs die; we must try to keep our traditions alive. I know that in many parts of the world, they are not interested in African spirituality because they feel superior to us; because they enslaved black people, they feel superior. I know that for them, it is not the same as it is for us, but there comes a time when we must take ownership and say: this belongs to us. Many people are afraid of African spirituality, but the people who are afraid of African spirituality are the people from the developed countries. Our religious beliefs are a presentation of our African ancestry; we cannot live without our past and therefore we must upkeep our customs and develop them. Ishmahil Blagrove Jr., is a documentary film maker. He has covered stories for such broadcasters as the BBC and Channel 4 news in Britain. He is presently a director and editor of Rice'n'Peas - an award-winning media company.